This paper may be of use to people working on plant microbiomes. Molecular methods for microbial community characterization have uncovered environmental and plant-associated factors shaping phyllosphere communities. Variables undetectable using bulk methods can play an important role in shaping plant-microbe interactions. Microscale analysis of bacterial dynamics in the phyllosphere requires imaging techniques specially adapted to the high autoflouresence and 3-D structure of the leaf surface. 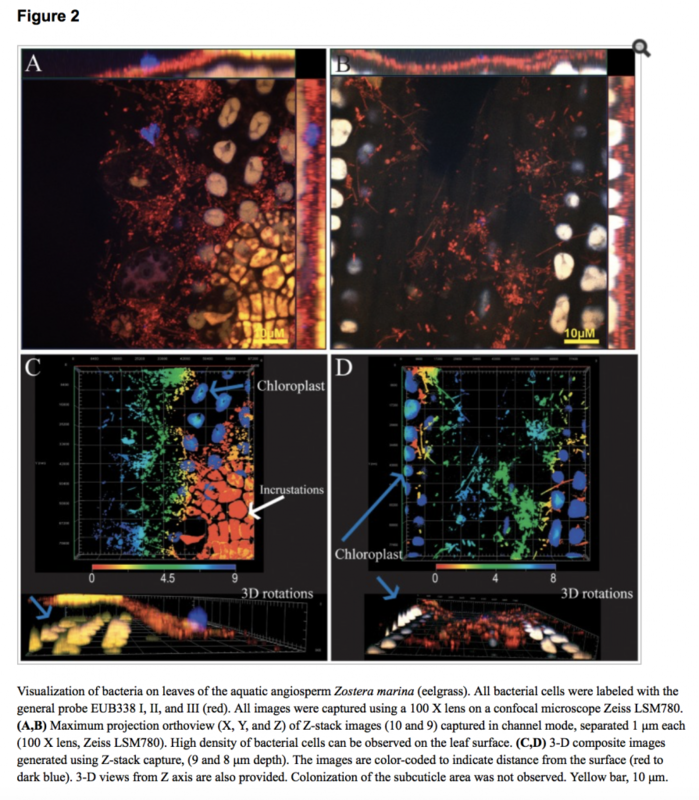 We present an easily-transferable method (Leaf-FISH) to generate high-resolution tridimensional images of leaf surfaces that allows simultaneous visualization of multiple bacterial taxa in a structurally informed context, using taxon-specific fluorescently labeled oligonucleotide probes. Using a combination of leaf pretreatments coupled with spectral imaging confocal microscopy, we demonstrate the successful imaging bacterial taxa at the genus level on cuticular and subcuticular leaf areas. Our results confirm that different bacterial species, including closely related isolates, colonize distinct microhabitats in the leaf. We demonstrate that highly related Methylobacterium species have distinct colonization patterns that could not be predicted by shared physiological traits, such as carbon source requirements or phytohormone production. High-resolution characterization of microbial colonization patterns is critical for an accurate understanding of microbe-microbe and microbe-plant interactions, and for the development of foliar bacteria as plant-protective agents.